There is much to do in October, especially as the shortening days can suddenly leave one with unfinished work. An important part of this month’s vegetable gardening is harvesting, so I hope you will be enjoying the fruits of time well spent. I find it a strong sign of moving into the winter half of a year when pulling celeriac, digging parsnips, picking brussels sprouts and cutting red cabbage. My gardens have responded well to the fine weather in September when we have had more sunshine than in both July and August. 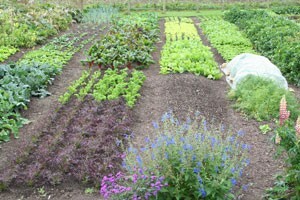 Second-crop salads such as endives, chicory, lettuce, mustards, rocket, mizuna, sorrel and chervil have been growing leaves of high quality, helped by occasional watering. In the polytunnels, tomatoes which were showing signs of succumbing to blight have recovered amazingly and cropping has been phenomenal. Aubergines, peppers, chilies and basil have also done well. But that will change in October when it is the season for planting winter salads indoors, giving them time to establish before winter. Through September I have been sowing Grenoble Red lettuce (for leaves not hearts), sorrel, chervil, spinach, chard, endive, winter purslane and latterly rocket, leaf radish and mustards, to have plants ready for popping in as soon as summer crops are about to finish. Sometimes it hurts to pull out still-fruiting plants – there are always some tomatoes and other fruits that never quite mature, so a few of the nicer trusses will be hung indoors to finish ripening. 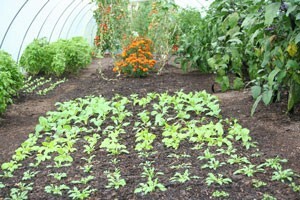 As a rule of thumb, I aim to finish planting winter salad in the tunnels by the last week in October, apart from mizuna which grows so fast that it can be sown in October and planted as late as early December, for weekly picking of leaves until April. All of these plants are winter hardy and if they are to have any problems with weather, I have found that dampness is worse than extreme cold. Last winter I lost some lettuce in a tunnel whose doors were shut over the new year, in frosty weather, while lettuce in the other and more draughty tunnel all survived. So give them some ventilation every day, unless it is blowing a true gale. One benefit of growing brassica salads in winter is that their caterpillar and flea beetle pests are mostly dormant. Whereas at the moment in September, I am somewhat overrun with caterpillars on pak choi and some varieties of kale, and we are squashing some every day. Unfortunately a few have crawled along the soil from the kale to some neighbouring chinese cabbage, whose fleece cover is not buried in soil along its edge. I hope it is only a few because the chinese cabbage are growing beautifully, a real challenge to grow well and the only crop I cover with fleece or mesh against butterflies. If you planted pumpkins and winter squashes in good time, they should be maturing now with hardening skins and drying stalks. They look beautiful in the garden and can be left out until month’s end, barring any freak frosts below about -2C, and then brought in somewhere warm and dry if possible, for keeping until spring; otherwise keep an eye on them and eat before or as soon as you notice any moulds. Apples are puzzling me this year because many are dropping earlier than usual, even after a poor summer. Perhaps the warm spring was enough to advance their maturity. Whatever the reason, my early to mid October picking is starting to happen now in late September, according to variety, and especially of those trees whose fruit is showing yellow colour. There is one outdoor planting to do this month, of garlic. I shall be dibbing shallow holes for the largest of my own cloves at 4″ x 18″ spacing (10cm x 45cm), in a bed where french beans are just finishing. After planting I shall cover with two inches of well rotted compost or manure. Broad beans are sometimes recommended to plant in October but I find that early November is better, so they do not grow too big before midwinter, when small plants resist frost better than large ones. Spreading organic matter on top of soil to feed worms and all the other soil life is a fruitful job for October, bringing extra fertility for next year’s cropping. Suitable to use are well rotted composts and animal manures of any kind. 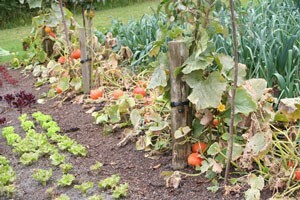 The more rotted and crumbly they are, the easier it will be for early sowings and plantings next spring. If you have only strawy, fibrous organic matter to use, I would spread it anyway and then rake off the most fibrous parts in late winter, once frost and weather have broken it down. I keep my best compost for where I shall be sowing carrots, parsnips and planting salads, while the less rotted is suitable for plantings of courgettes, leeks, potatoes and so forth. 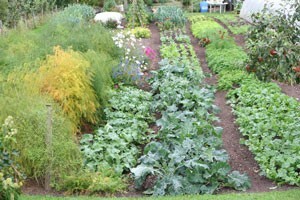 All of this advice imagines that you are on top of weeds, as should be the case in any well maintained no dig garden. If not, look at mulching ideas elsewhere on this site. In my gardens, with no digging to do, spreading compost and manure is my main winter job for the vegetable beds. Occasionally there is weeding to do, but not a lot now the soil is so clean.